After extensive investigation into the latest skincare ranges, the decision was clear and we are proud to introduce the Environ® range to our skincare treatment collection. 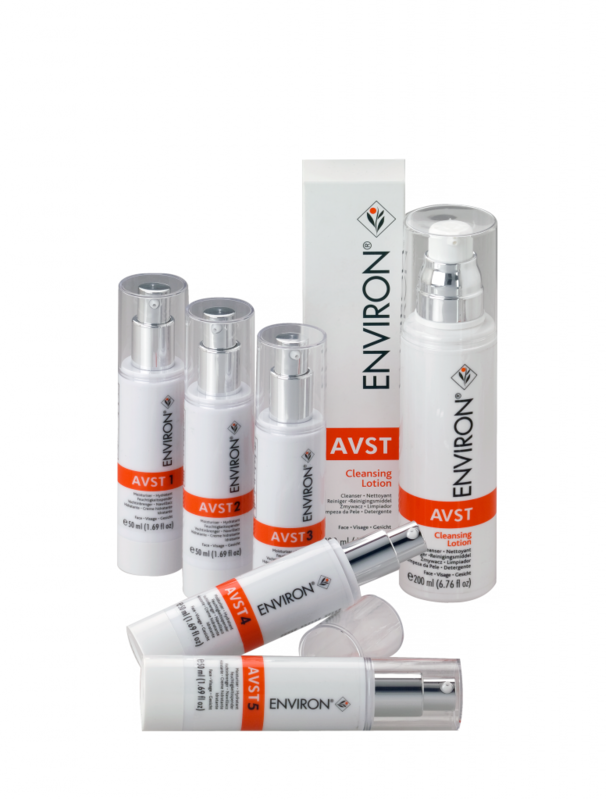 The Environ® skin care range was first formulated as a result of studies in south africa by Dr. Fernandes into the mechanisms of skin healing. The introduction of vitamin a into the formulation of skin care products heralded a new era in the treatment of sun-damaged skin. Although some cosmetic houses were using very low doses of vitamin a in their skin care products in the 1980s, Dr. Fernandes, a prominent cape town plastic surgeon, was the first person in the world to introduce intense vitamin a treatment in high effective doses with startling results. 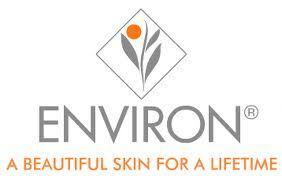 This range established Environ® as a leader in skin care treatments with fans around the world. As we get older, more intensive treatment is required to treat the signs of ageing, pollution and the sun. Daily treatment using the Environ® range will help reduce and delay the signs of photo-ageing. Environ® skin care products have been formulated to combat the harmful effects of the harsh climatic changes of today’s environment, specifically pollution and ever-increasing doses of radiation from the sun due to the thinning of the protective ozone layer. Environ® products offer a definite regime to nourish, protect and maintain a healthy, youthful and beautiful skin. Each product is made from the highest quality ingredients. They are mostly free from fragrance, preservatives, colourants and animal extracts. It is important to progress through the levels as going straight into concentrated vitamins (i.e. higher levels) can cause a reaction. 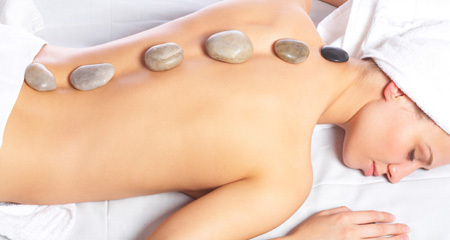 This treatment regime produces amazing results. See below the results after 5 years on the Environ avst moisturiser plan – the skin looks younger, fresher and tighter! The Ionzyme range is Environ’s premium range of skin care products that provides a complete skin care programme containing essential vitamins, antioxidants and peptides. This scientifically advanced combination of ingredients works in synergy to assist in the appearance of a smoother skin texture with a healthy glow. Rad SPF 15 lotion – a revolutionary sunscreen containing sun filters and sun reflectants that give an SPF 15 to provide protection from both UVA and UVB irradiation. Also contains antioxidant vitamins to combat the effects of the sun and pollution on the skin. Highly recommended for all skin types and suitable for all ages, including babies. Rad does not contain vitamin A. 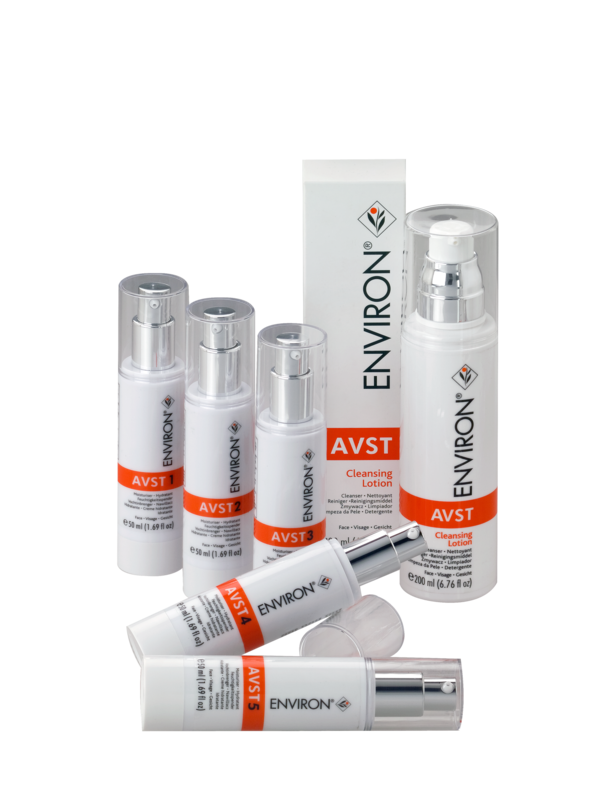 The Environ ß-Active range is a 5 step skin care programme formulated for consumers who have problem skins. We recommend that the ß-Active range be used in conjunction with the vitamin A moisturisers in the Original/AVST range. Most of the products in this range contain a combination of Australian Tea Tree Oil, colostrum and salicylic acid. 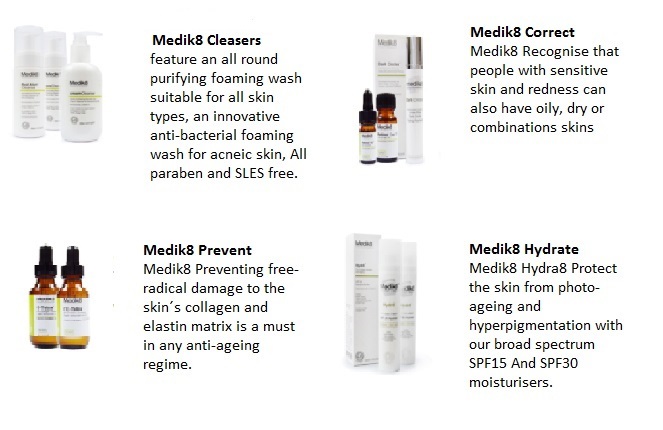 Medik8 is a British skin research company pioneering in cosmeceutical technologies. Our products are suitable for the most sensitive skin without compromising efficacy. advances in active selection, delivery systems and mild base formulation means you no longer need to compromise. SkinMedica is a specialty pharmaceutical company located in Carlsbad, California that develops products to treat dermatological conditions and diseases and improve the appearance of skin. 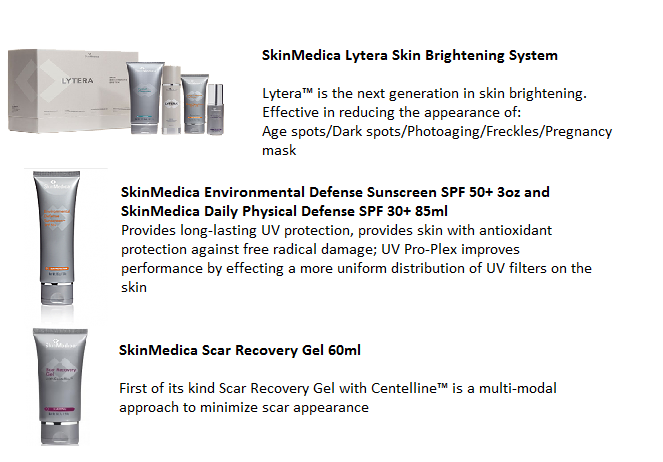 SkinMedica manufacturers a full range of cosmeceutical products, including cleansers, toners, sunscreens, and retinol products. Their lead product line Tissue Nutrient Solution, or TNS™, is designed to enhance skin appearance, reduce signs of aging and provide other skin care benefits.